WunderRug holds rugs float and in place on top of carpet. Special dry adhesive is guaranteed not to transfer. WunderRug is pure white - there is no color to stain. WunderRug is washable. Roll widths available are 2', 32", 6' and 9', all rolls are 98' in length. 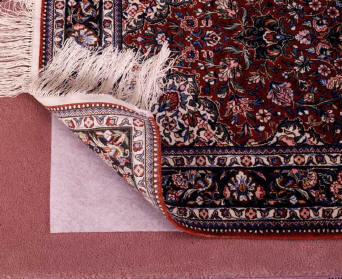 WunderLock is the premium product used for rugs on carpets, guaranteed to hold any rug on any carpet. 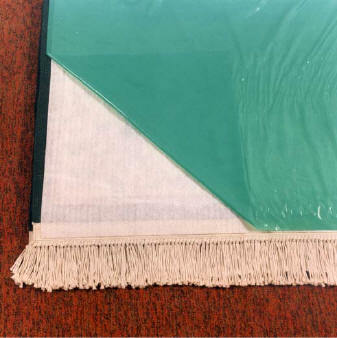 Especially ideal for lightweight rugs, dhurries, and high-traffic areas. WunderLock is manufactured with a special "dry" adhesive that is nontransferable. WunderLock is washable, and foil backed for easier installation. Roll widths available are 3' and 6', all rolls are 88' in length. Precut sizes available 3'x5', 4'x6', and 6'x9'.